Despite crossing the plate only twice in the 18 innings of what I like to call the losing sandwich (Wednesday and Thursday) — going 1-for-17 (.059) w/RISP — the Tampa Bay Rays offense came back to life Thursday night, tagging the Blue Jays for seven runs on 11 hits and five walks. The Trop dwellers were mightily productive, mashing three doubles, a triple, and their first homer of this very young season — a seventh inning three-run shot off the bat of Evan Longoria (career homer number 163, tying Carlos Pena for the franchise record). Chris Archer looked good in his first start of the season, slashing 6 IP/4 H/2 ER/2 BB/7 K on 98 pitches (60 for strikes). 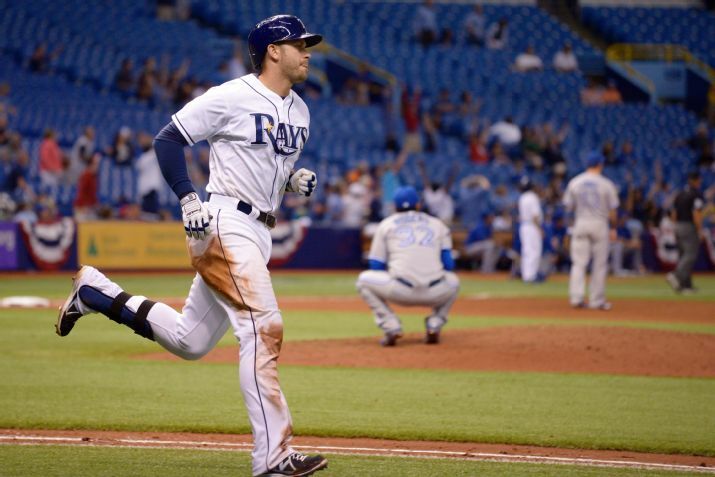 And though they didn’t win the first home series of the season, the Rays salvaged the four game set. They’ll ride back into the Trop, Friday night, on a wave of momentum when the beleaguered Texas Rangers come to town for a three game set. This doesn’t look like the same Rangers we’ve grown accustomed to seeing the last few years, thanks in part to off-season moves, and a tsunami of injuries that have plagued the boys from Arlington. On the DL are catcher Geovany Soto, pitchers Matt Harrison, Derek Holland and Joseph Ortiz, and position players Engel Beltre and Jurickson Profar. A caveat; despite the injuries, the Rangers are off to solid start. 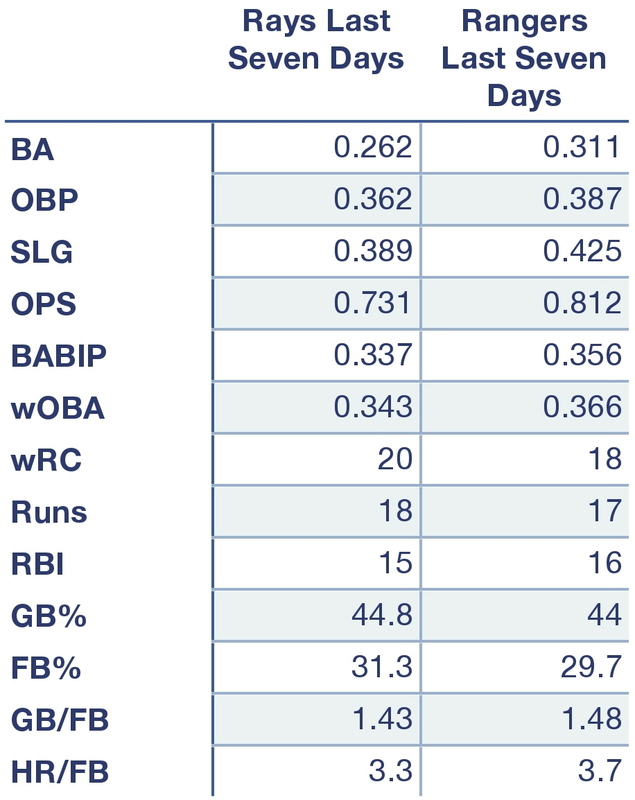 Rays and Rangers offensive production in the first week of baseball. Rays and Rangers, by the numbers. Jake Odorizzi vs. Joe Saunders: Playing for his fifth team, veteran LHP Joe Saunders will make his Rangers debut Friday after going 11-16 with a 5.26 ERA in 32 starts for the Mariners last season. The Rays blew up Saunders last season, tagging the lefty for five runs on seven hits, including a homer, in 4-1/3 innings of work. Overall, Saunders is 0-3 with an 8.40 ERA in three starts against Tampa Bay. Key match-ups: Yunel Escobar (5-12), James Loney (8-29, 2B, 2 HR, 6 RBI, 2 BB), Evan Longoria (2-8, 2 HR, 4 RBI, BB), Wil Myers (2-3, 2B, 3 RBI), Sean Rodriguez (2-3). “…Martinez had a 2.50 ERA on the year in 151.1 innings, and while his peripherals didn’t change much between 2012 and 2013, he dramatically reduced his hits allowed, giving up 4 fewer hits in 2013 despite throwing 34 more innings. 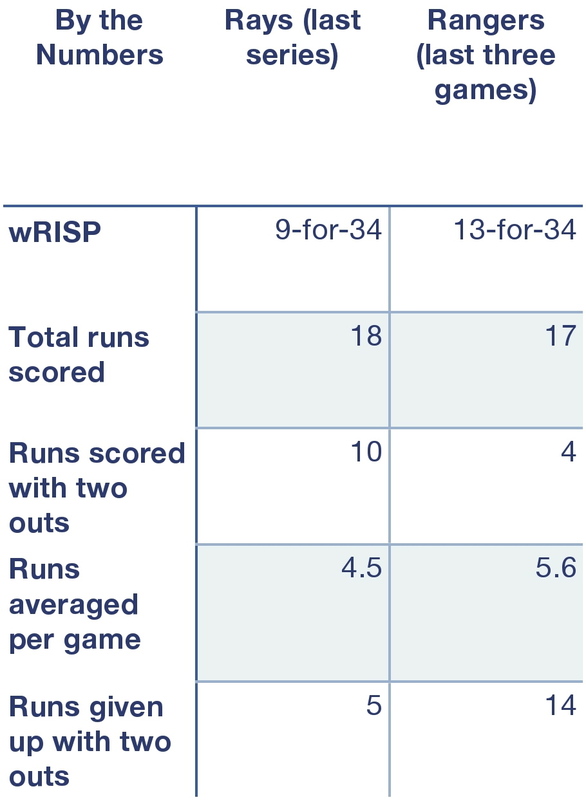 Alex Cobb vs. Yu Darvish: Yu Darvish is slated to make his 2014 season debut, after being shelved with a stiff neck way back at the beginning of Spring Training. Darvish hasn’t faced a hitter swinging a bat since March 16 in Arizona. He was scratched from his Opening Day start after his neck didn’t feel right, but an MRI showed no structural damage. He hasn’t been kind to the Rays in his short career, going 2-0 with a 1.35 ERA in 20 innings of work. David DeJesus returned to the lineup Thursday night for the first time since bruising his right foot Monday, going 2-for-5 as DH with a double and a triple. Thursday’s attendance (9,571) was the lowest at the Trop since April 30, 2012, vs. the Mariners (9,458). The Blue Jays have not won a series in the Trop since 2007. Per Joe Smith of the Times, former Rays C Chris Gimenez cleared waivers with Texas and was outrighted to Triple-A Round Rock. He has 72 hours to accept or reject the assignment. If he rejects it, expect the Rays to push to sign him for depth at Durham.